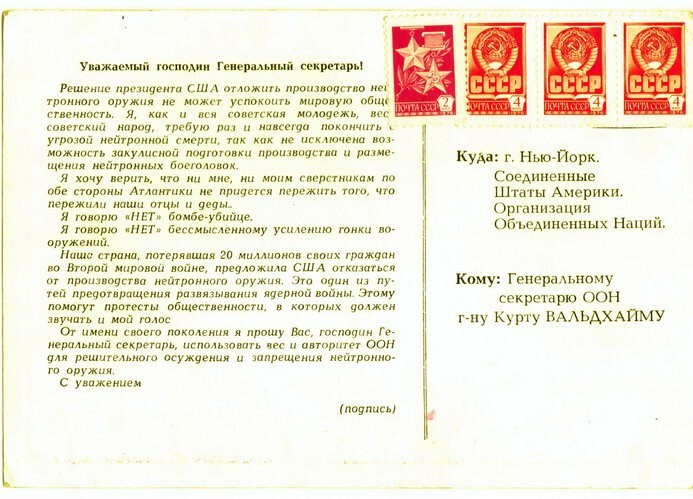 These cards were distributed to the Soviet citizens so they could be mailed en masse to the United Nations Secretary-General Kurt Waldheim. Based on his years on that post the time would’ve been between 1972 and 1981. The decision by the President of the USA to postpone the production of neutron weapons cannot pacify the world public. 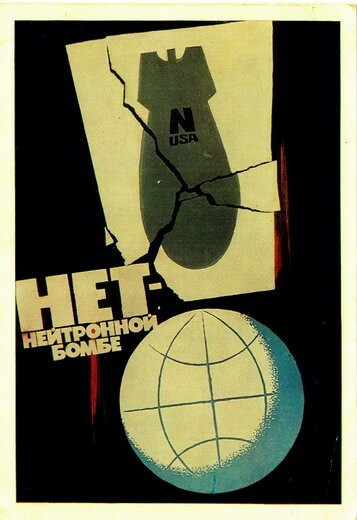 I, together with all the Soviet youth and the Soviet people, demand to once and for all stop the threat of the neutron death, since there still exists the possibility of covert manufacturing and deployment of the neutron warheads. I want to believe that neither me nor my contemporaries on the other side of the Atlantic will never have to relive what our fathers and grandfathers had to live through. I say “NO” to the killer-bomb! I say “NO” to the senseless ramp up of the arms race! Our country, which lost 20 million of its citizens in the World War II, proposed to the United States to abstain from manufacturing of the neutron weapons. The is one of the ways to prevent the nuclear war. Public protests, including my own, will help that cause. On behalf of my generation, I implore you, Mr. Secretary-General to use the authority and the influence of the United Nations to strongly condemn and ban the neutron weapons. And now we dance – Children’s Choir – The Chase.